Last summer two college grads, Lake and Catrin, were biking from NYC to California visiting farms along the way. Caught in a sudden summer storm, they ended up on our front porch and we shared an interesting discussion about food and farming over pizza. Interesting, because we came to the table with very different perspectives. You really need to understand the full story behind their visit. I blogged about it here. She caught me off guard with that statement and I’ve pondered it quite a bit since. I do understand why she made the observation. We had just closed an intense conversation about food security in U.S. cities. I think she was feeling rather boxed in by our castle walls of corn (that’s how my daughter refers to the fields) and overwhelmed that there was so much. AND I had clarified that field corn eaten directly off the cob is not recommended. Save that act for sweet corn. As our corn starts to pop up in rows this spring, I suppose many will look at these acres and think solely of this crop as food — as in pull-it-off-the-plant-and-pop-it-in-the-mouth-food. But I’ve often stared at the 400 plus acres that surround our farmstead in wonder. Here’s this one rather simple crop from which we humans have learned to make so many different things. Corn is food – corn flakes, corn muffins, corn chips and then of course all the ingredients (sugar, oil, starch and meal) we find in different products from pop to soups, cereals to granola bars. Corn is fuel. It took 30 years and millions in research dollars to bring corn ethanol to the marketplace as a viable fuel alternative to petroleum gasoline. It will take many years and millions in research dollars to bring another alternative fuel to the marketplace. 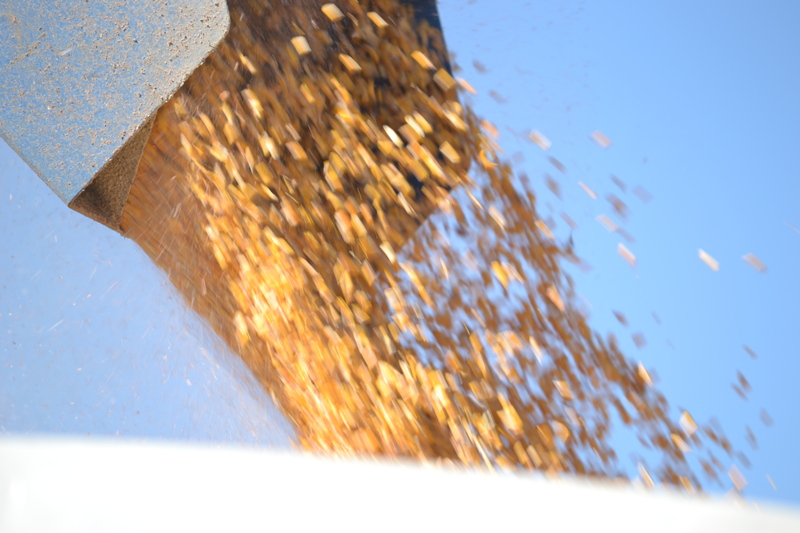 Those efforts are underway but with a political environment shunning corn ethanol, why incentive will others have to make investments in new biofuels. Corn is feed for cows, pigs, chickens, horses, sheep, goats . . .
Corn oil is found in plastic water bottles, some sunscreens, lotions and batteries. Corn starch coats magazine pages to help the ink stick and is in sidewalk chalk. But corn is more than things. Corn is jobs. In our rural area, corn is seed salesmen and women, implement dealers, truckers, bankers, mechanics, agronomists, grain bin builders, electricians, grain marketers. . .
A cotton farmer could probably list all the great things that come from cotton and a wheat farmer will say the same thing about wheat. The point is all this corn equals more than kernels to eat. In our piece of America it equals community. This entry was posted in Farm & Food and tagged biofuels, corn, ethanol, feed, Food, fuel, gmo, harvest, plant14, planting. Bookmark the permalink.